At 977 feet tall and situated atop the peak of San Francisco's biggest hill, the three-legged Sutro Tower dominates the city's skyline. But this isn't some grand scale art installation like Cupid's Span; this massive structure acts as a vital part of San Francisco's communications infrastructure, bouncing radio waves over Twin Peaks and all the way out to the ocean. San Francisco's iconic hills aren't just impediments to pedestrians, they effectively block radio waves and line-of-sight television signals as well—especially 922 foot tall Twin Peaks, which sit in the south central area of the city, forming a wall between Downtown (in the northeast of the city) and the Outer Sunset (in the southwest). Before construction on the tower began in 1971, television reception—remember this was the age of rabbit ears—in the Sunset was spotty at best on account of all the hills. The Bay Area did have multiple TV signal transmitters on a number of regional peaks including San Bruno Mountain, Mt. Allison, Monument Peak, and Mt. Diablo—but the signal quality of each varied depending where you were in the city. Sutro Tower was designed to act as a central transmitting hub for the entire city. By centralizing the main Bay Area TV signal transmissions, rather than receiving from the multiple regional sources, everybody in San Francisco would be able to get all of the channels all of the times without having to fiddle with the rabbit ears. The tower itself stands 977 feet tall, its tallest point reaching 1899 feet above sea level, making it the single highest point in San Francisco. To support the massive steel superstructure—especially in earthquake country—engineers poured 132,000 cubic feet of concrete, giving the 3.5 million pound (1,700 ton) tower a center of gravity 16 feet underground by placing two-thirds of the entire structures weight below the Earth's surface. And despite the promise of better signal, the initial public reaction to the tower proposal was less than welcoming even before construction started in 1971. 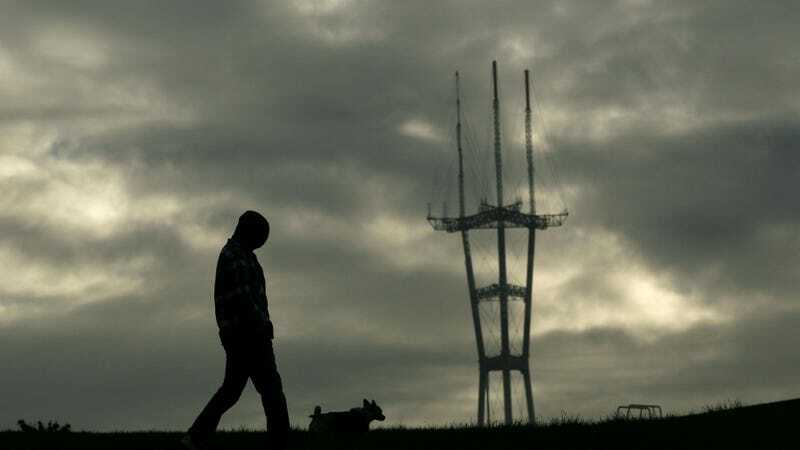 Many residents feared the tower would spoil their views of the existing skyline, while columnist Herb Caen quipped, "I keep waiting for it to stalk down the hill and attack the Golden Gate Bridge." However, the plan moved forward despite the protests and ushered in a new era of clearer television and radio reception.